For the first time, a pickup truck has earned the highest possible safety rating from the Insurance Institute for Highway Safety. The 2017 Honda Ridgeline has earned a 2017 Top Safety Pick+ designation thanks to Honda’s unrelenting commitment to technology and safety advancements. Drivers will find more active and passive safety features inside and out to help drivers operate more safely on the road, as well as safety built into every model, from the materials used to the design and engineering. All Honda models come equipped with standard safety equipment that drivers would be hard-pressed to find on comparable entry-level models from other brands. A multi-angle rearview camera comes standard on every Honda model in 2017 and offers drivers the ability to switch between a normal angle, wide angle, and a top-down angle. Other features that drivers can expect to find on every Honda model in 2017 includes Advanced Compatibility Engineering (ACE) body structure, which absorbs and distributes crash energy away from the passengers inside; Vehicle Stability Assist (VSA) with traction control; an anti-lock braking system; and side curtain airbags, front airbags, and front side airbags, with some models featuring a rollover sensor. 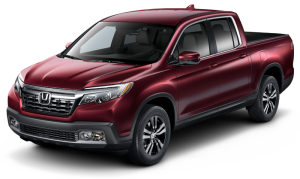 Find out more about everything the 2017 Honda Ridgeline has to offer drivers by stopping into any Central Illinois Honda Dealer today to get some firsthand experience behind the wheel and on the road with a test drive.